This is a real-photo postcard of the house that still stands at 188 Granite Street in Pigeon Cove. 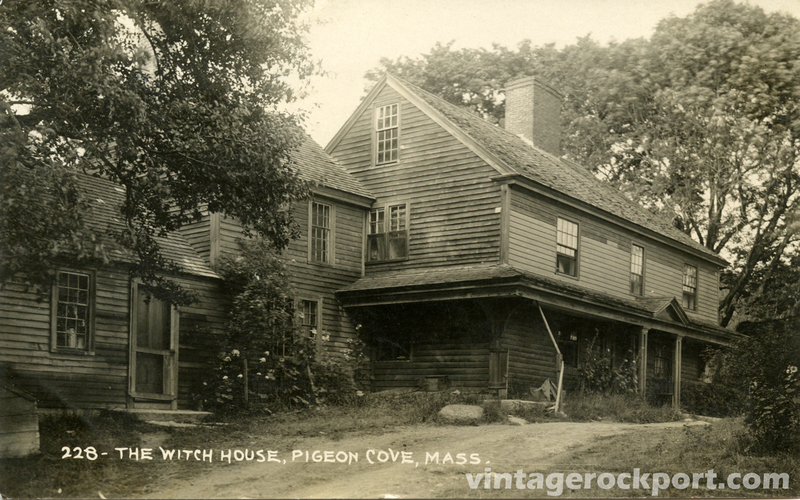 The house — which is listed on The National Register of Historic Places — is often called the Witch House thanks to a popular story that it was built in 1692 by two brothers from Salem to protect their mother, who suspected of being a witch. The house is also called the Garrison House and some believe it to be the earliest surviving building in Rockport. According to this story, the original part of the structure was built in 1676 as a defense garrison during King Philip’s War. We know for certain that, starting in 1704, Joshua Norwood and his family lived here for some 30 years, until they moved to Gap Cove near Straitsmouth Point. In the mid-1800s, the house was run as a boarding house by John Wheeler. A prominent guest who often stayed there was Richard Henry Dana, the poet and lawyer and father of Richard Henry Data, the antislavery activist and author of Two Years Before the Mast. For two years beginning in 1870, the house was occupied by Dr. Augustus M. Tupper, a popular physician in Rockport for 50 years. In 1925, the house was purchased by Oliver Williams and remains owned by the Williams family. For more about the history of the house, see my prior posts here, here and here. This entry was posted in Uncategorized and tagged Pigeon Cove, Witch House. Bookmark the permalink. I have a question? I would like to purchase framed pictures of Rockport. I noticed postcards available VintageRockport by SmugMug. I like the many postcards yet prefer a framed picture in various sizes. Any suggestions? The house was sold by the Williams family in 2013.